Thamsar leads to Bada Bhangal. Named probably after one of the lakes on either side of the pass Thamsar has a romantic appeal paralleled by none. ACCOMODATION Tents - 12 Nights. The Thamsar of my dreams. The Thamsar that leads to Bada Bhangal. Never judge Thamsar by what I have to say. I dreamt of going to this pass since I was 3 and it took me 25 years before it became a reality. Named probably after one of the lakes on either side of the pass, Thamsar has a romantic appeal paralleled by none. Leading to a village of 400 people, over a centuries old mule trail, its your pass to bliss, a pass to another land, a land untouched by road. 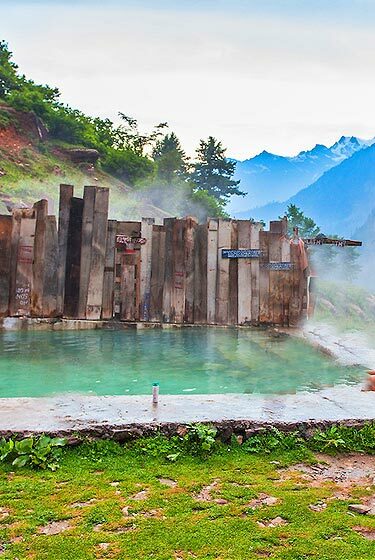 There are some makeshift shops on the way, 2 beautiful lakes on either side of the pass, Pir Panjals, 3 sister peaks above Panhartoo, lush green meadows with fabulous yellow flowers and a few waterfalls. 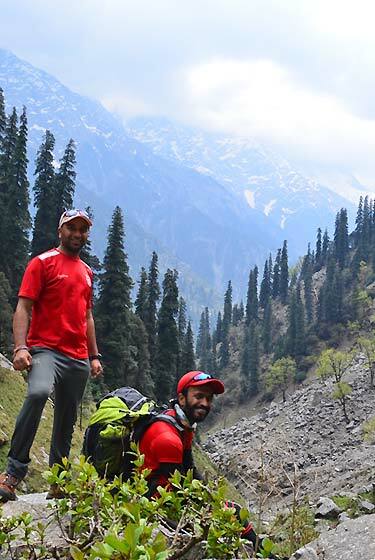 The first day of the trek leads through cool forests of giant deodars (Cedar), climbs gently through Manalsu valley with the Manalsu torrent for company. campsite in the lush green meadow of Lamadugh. The trail now begins to ascend steeply through woodlands and meadows. With wild alpine flowers strewn all around. The brilliant shrubs of Rhododendron and Birch pave the way to the pass after which a descent leads to the campsite. A lovely walk through the lush forest and over the debris of glaciers. A short ascend to the campsite. 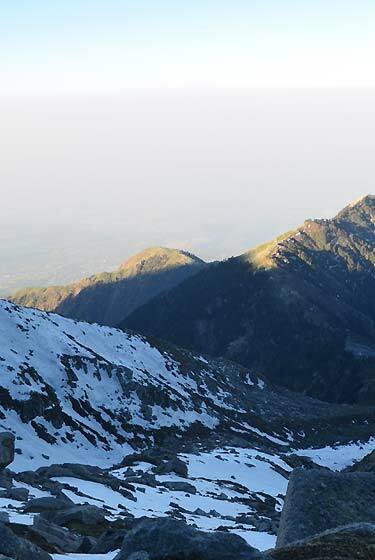 All around the famous mountain peaks of the Kullu and Lahoul valleys afford an unforgettable evening. Today the landscape slowly begins to change, as forests and meadows give may to rocky outcrops with patches of snow starring to appear. A rather steep climb through glacial debris and snow, and the top of the pass is reached. 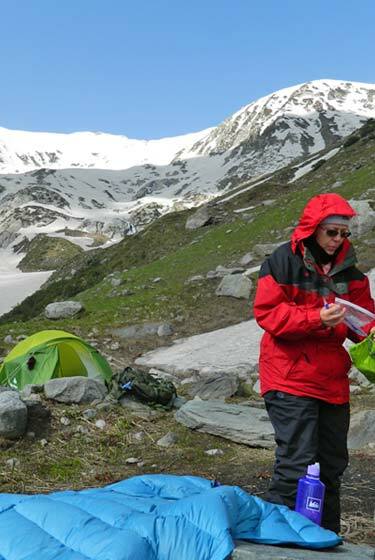 Breath taking views envelop the crest of the pass and after a brief stopover, descending through glacier and moraine leads to the campsite on the bank of the sparkling mountain stream. Now the trail leads down in to the Soony river, via Devi Gote. A small temple constructed by the shepherds (Gaddies) for the protection of the sheep and themselves from the natural catastrophes and the animal. Pay the homage to the Goddess and continue to the campsite. Leaving this beautiful campsite, the path winds through rocky terrain, soon replaced by meadows again. The trail begins to ascend, a forest begins to appear, the river rushes through spectacular gorges: as soon as crossed via snow bridge or temporary wooden bridge, campsite is reached. The trail now winds its way down towards the valley floor, after which almost level walk leads to the camp just before the tiny ancient village of Bara Bhangal. A remote and isolated village open only four or five months in a year. The inhabitants are the legendary Himalayan shepherds (the Gaddies) who lead a nomadic life, leading their vast flocks of sheep and goats in high mountain summer pastures, and in autumn returning back to their isolated existence in the village. A steady climb to the camp site: the scenery changes there quite dramatically while the air became cooler. The cill of the evening is replaced with the comfortable warmth of a lively campfire . Today the trail steeply emerges from the rocky and glacial terrain in to the softer landscape. The lakes on both side of the pass offer a spectacular view of Dhauladhar range with mighty Manimahesh Tibba on the north of the pass. Steep descend to the campsite of the Pannihartu. After breakfast drive to lamu Village and further trek to kwarsi. 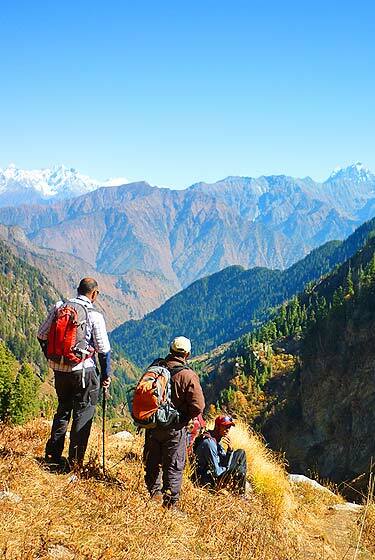 A footpath is developed and few small wooden bridges are made at few risky spots to ease the trekkers and local people. The trail goes through the forest of oak and rhododendron. From Billing direct descend to the Bir. As the Billing is well known for the paragliding, the participants from all over the India as well as foreigners use to take part in the competition. On the way extensive view of the lush green Kangra valley are speated and soon the steep descend ends at the tiny Tibetan settlement of Bir. 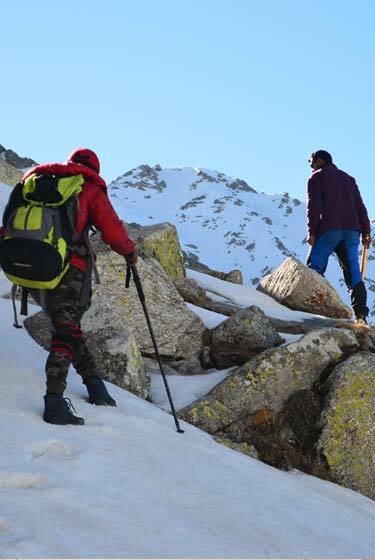 A delightful last day to this most wondrous of the trek through the land of the legendary Gaddis, tough and wiry Himalayan shepherds.On the way visit the Tibetan settlement and the monastery at Bir, Chamunda Devi temple in Palampur. After driving 50 km., reached at Dharamsala.